A BBC cameraman was assaulted in an 'incredibly violent attack' as President Donald Trump was accused of whipping his rally into a 'frenzy' against the media in Texas. Describing what unfolded, he said a Trump supporter mounted the press gallery and pushed the camera into his colleague, before continuing to push Skeans. 'It was an incredibly violent attack. Fortunately our cameraman is fine, he is made of stern stuff,' O'Donoghue told the Today programme. 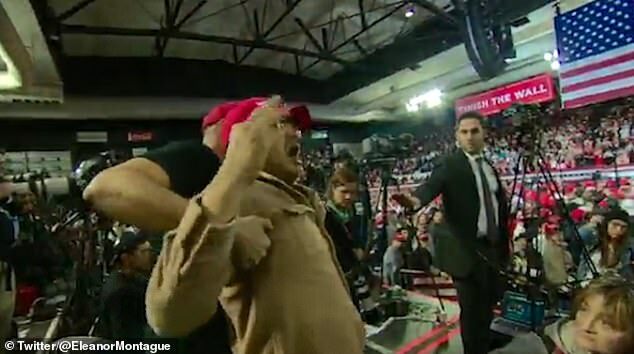 As the camera appears to visibly bounce around for around 10 seconds, the screen then focuses on a man in a red 'Make America Great Again' cap who is being restrained by another man in a black t-shirt. 'This is a constant feature of these rallies - a goading of the crowds against the media,' O'Donoghue added. O'Donoghue said Trump's 2020 election campaign, which he thinks has begun, will be as 'hostile and ill-tempered and divisive as the one we saw last time'. A BBC spokeswoman said Skeans was 'violently pushed and shoved by a member of the crowd' as he covered the rally. 'The man was removed by security and Ron is fine. The president could see the incident and checked with us that all was OK,' she said. The President, speaking on a stage flanked by two large red 'Finish the Wall' signs, made it clear why he came to the border. 'A wall is a very good thing, not a bad thing,' he told Fox News host Laura Ingraham in an interview after his rally. 'It's a moral thing, to put it in the opposite terms. We don't even say build the wall anymore. In freewheeling remarks at his rally, Trump also trashed the 'Green New Deal,' but didn't single out its most prominent backer, Rep. Alexandria Ocasio-Cortez – although he bashed Democrats generally.